Invisible Starts and Stops Part II: Burying the thread ends. My first show quilt was my own bed quilt and it has been washed several times (sadly, cats will make you do that to a quilt). The thread ends have never come loose and I attribute that in part to burying the threads. When you bury thread, you put the knot between the quilt layers. It doesn’t get catch or rub against anything. 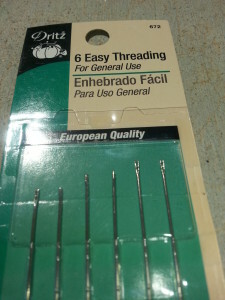 To do this, you need a highly specialized tool, the self-threading needle (available at Joann’s). Instead of a closed eye, the needle has a V at the top, which allows you to slip the thread ends through the V (your thread ends will have to be longer than your needle). You can see the notch above the eye of the needle the photo below. These needles are usually available at local quilt shops and big box craft stores. Then you pull your needle through the fabric starting where the thread ends come out of the fabric. In some cases, when it is hard to get your needle through the fabric, use a hemostat ($3 at the hardware store) to grab the needle and pull it through. A link to a short video on burying the threads is here.